BAGHDAD, Nov 14, 2006 (AFP) - Moayyed Mohsen likes to paint great figures from Iraq's past like the mythical hero Gilgamesh. But this year he turned his talents to another larger-than-life subject in his country's history -- Donald Rumsfeld. Dominating the wall of a Baghdad art gallery in the Sunni neighborhood of Adhamiyah is a massive mural that is no tribute to the outgoing US defense secretary. 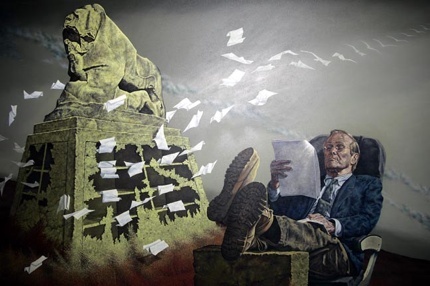 Rumsfeld is depicted leaning back reading papers, with combat-boot-clad feet propped up on a ruined building. Beside him is a weathered image of the Lion of Babylon -- potent symbol of Iraq's illustrious past -- atop a ruined plinth. The US official is surrounded by whirling bits of paper that morph into birds and fly off into the distance. The artist's image is striking and it was conceived in anger -- not just over the occupation of Iraq but also over what Mohsen sees as the humiliation of a nation that once taught mankind how to write. "I long wondered if I could somehow find a way to concisely express my own and everyone else's concerns about the war and Iraq," the artist told AFP from his home in Hilla, the capital of Babil province south of Baghdad. "When I painted this, I felt I wanted to talk to Rumsfeld, to know why we got into this situation," he said, saying the one meter by a meter and a half (3.3 by 4.9 feet) painting took three months to complete. More than any other official, the controversial Rumsfeld came to symbolize the US intervention in Iraq as one of the main architects of the invasion and subsequent occupation. His resignation on November 8 -- the first casualty of the Republican defeat in mid-term congressional elections last week -- met with almost universal acclaim across Iraq's divided communities, who seem to agree on little else than the situation in their war-ravaged country is getting worse by the day. Many Iraqis feel the US defense secretary's handling of the war showed arrogance and disdain for their country -- tellingly symbolized by his famous quip that "stuff happens" when asked to comment on the looting of Baghdad, including its museum, in the invasion's aftermath. Mohsen, who loves reading American magazines, said his model was a photograph he found of Rumsfeld. "The way he sat was very strange to us here in the East -- it is an insult to those around," he said. In the Middle East, showing the soles of one's feet is considered very poor manners, so the Rumsfeld in the painting automatically offends the viewer. The Lion of Babel atop a ruined perch sends another message. "I decided to make the base of the statue a bookcase containing volumes on the arts, literature and knowledge left by Iraqis," he said. "Then I destroyed the base to symbolize the repeated wars and showed the papers flying through the air and changing into white birds showing love and peace to the world." By juxtaposing his subject with ancient monuments, Mohsen sought to pit the endurance of history against the fleeting nature of man -- an apt visual statement, it turned out, in light of Rumsfeld's resignation. "The lion is a long-lived symbol expressing creativity and sublime artistic work in Mesopotamia, while the person is modern and fleeting and will end one day." Mohsen, who is in his 50s and rarely leaves his home in Hilla these days, said he likes to mix past and present to provoke viewers and make them think. Art in the service of politics has a lengthy history in Iraq, especially under deposed dictator Saddam Hussein whose cult portraits as everything from warrior, to Bedouin leader to camera-toting tourist once adorned all parts of the country. Mohsen maintains that he never painted images of Saddam, and said he now makes a living doing portraits. Although the Rumsfeld painting currently hangs in a Baghdad gallery, owner Qassem al-Sebti said he has put it up for sale through a New York gallery. He boasts that the US embassy here once offered him 35,000 dollars (27,000 euros) for it but he refused, a claim that could not be substantiated. "We thought we could get a better price for it in the US," al-Sebti said.